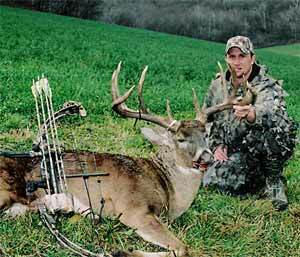 High Tines Outfitters of Wisconsin are located in the Number 1 County in the United States for producing P&Y and B&C class deer. High Tines Outfitters specializes in fully-guided hunts for turkey and Pope and Young class whitetail deer. We are located in Buffalo County, Wisconsin -- The Number 1 County in the United States for producing Pope & Young and Boone & Crockett class deer. If you check the record books, you'll discover that more Pope & Young and Boone & Crockett class bucks are harvested in our territory than any other area in the nation. Our greatest strength is allowing only a minimum number of hunters per week on our 2500 acres of prime deer habitat that is intensely managed for quality bucks. Our guides are well seasoned on deer movement and tactics. We strive to provide you with the best opportunity to score on the trophy of a lifetime. You will be hunting free roaming deer on quality managed land, so be sure to come prepared as you will be tested as a trophy bowhunter, muzzleloader or rifle hunter by our huge bucks, and that test can happen very fast and at any time! You will be staying in our newly constructed, 3200 square foot lodge that features all of the comforts of home. Hunting packages include comfortable lodging, meals, pre-scouted stand sites and transportation to and from your stand. We provide first-class hunts and gladly accommodate archery, muzzleloader and rifle hunters alike. For more information on available dates and price quotes go to the High Tines Outfitters web site below. To book a hunt now call: 608-289-5507, 608-289-7202 or E mail.